PENALTY rates are set to be the big issue at the next federal election, with Prime Minister Malcolm Turnbull taking workplace relations reform to it for a mandate. This approach is backed by the recently released Productivity Commission’s draft report on the Workplace Relations Framework, which has recommended Sunday penalty rates align with Saturday rates for cafes, hospitality, entertainment, restaurants and retailing industries. However, the report is basing this recommendation on benefits that are yet to be substantiated, describing them with the indefinite ‘‘may’’. Consumers ‘‘may’’ get better service, and they ‘‘may’’ face lower prices. Where it is more confident in its predictions is employment, ‘‘people outside the workplace’’ will gain a job and working proprietors will have a better ‘‘work-life balance’’, it says. It also finds most existing employees will ‘‘face reduced earnings’’ and ‘‘are not likely to obtain enough additional hours of work to offset the earnings effects of lower wage rates’’. So it follows that this report bases recommendations, which will disadvantage existing employees, on the fallacy that what is good for business is automatically good for society. But will the businesses gain? The report isn’t confident, highlighting increased business profits ‘‘seems highly unlikely in industries where competition is generally high’’. So it’s really a report that shows there are no quantifiable gains for the consumer, the unemployed or business owners. The report advocates valuing one sector of society’s access to a weekend higher than that of another sector. 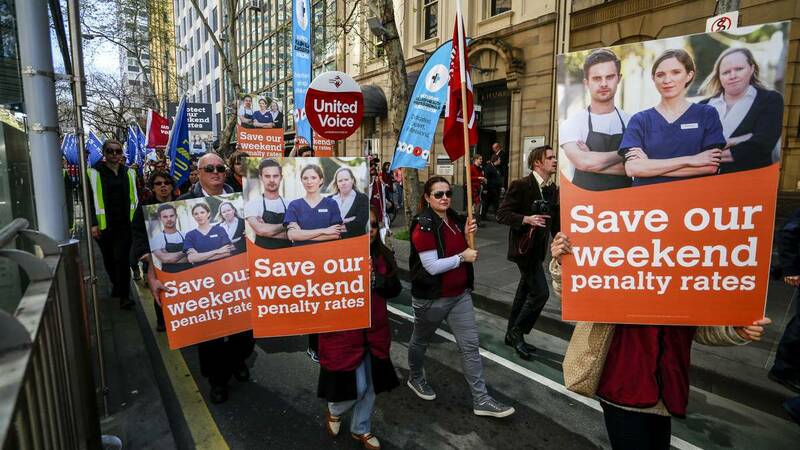 It finds that society values the inconvenience weekend work imposes on essential services and many other industries, hence their penalty rates are justifiable. Yet due to society’s expectation to be able to shop and eat out on weekends, we do not hold the same standard of value for the workers within these industries. The report itself highlights the industries targeted for penalty rate reduction are the lower paid and often younger workers. These are society’s ‘‘other’’, not ‘‘us’’. Their Sunday is no more valuable than their Saturday, right? And it’s certainly not more valuable than our weekend? And let’s not forget the unsubstantiated reduction in unemployment, could that potentially reduce ‘‘our’’ tax bill? The public debate thus far is completely economic and its shaping is strategically intriguing in its concealment of a greater goal. It is an interesting society we live in when we advocate valuing one sector of society’s access to sociable hours above another. It is a society without balance and obsessed with economic rationalism. It is a society that has lost its depth and breadth of character, and is no longer concerned with the notion of life beyond toil. It is a society that lacks the understanding that this toil is about more than just money, it’s about identity, skill and hopefully pleasure. As a business owner I understand the economy and profits are important. I pay penalty rates and sometimes I work the unsociable shifts to remind myself what people give up in order to make my profit and company reputation. As a mother and a member of society, I’ve come to believe the educationalist Alfie Kohn was correct when he said ‘‘economics has its place, it just doesn’t know its place’’. Whether I’m in emergency or brunching with the kids on a weekend, I value the people that are providing our service and not playing sport, hanging with friends or chilling in front of the PlayStation. I value that they are making mine and my kids’ day that little bit better and I’m happy to pay for that service. Are you? Australia Day, hit it out of the park.